This entry was posted on 20/10/2018, in Anecdotes, Corruption and Cheat, Dark Secrets, Hard Facts, Laments, News | Newsmakers. Bookmark the permalink. Sri Lanka had several failed and controversial projects in the past decade. Norochcholai Coal Power Plant, Hambantota Harbour, Mattala Airport, Uma Oya diversion, Colombo Port City to name a few. They cost billions of rupees however, but do not produce the expected benefits. Perhaps, many of them were not required for the country. This unwarranted development or over development was the result of political arrogance of the ruling regimes. 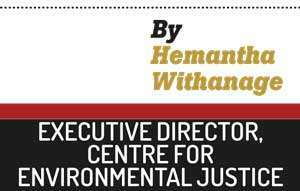 During the recent Environmental Impact Assessment conference held in Colombo, it was revealed that some major development projects did not even have a feasibility study or even a pre-feasibility study. The developers in both private and public projects expect the EIA process to deal with feasibility as well. There is no way that EIA teams can fulfil the task of making both feasibility and the Environmental Impact Assessment. The projects this way lack looking into the more feasible alternatives. Uma Oya diversion project is a clear example of launching the project during the previous regime without doing a feasibility study. Addressing the gathering on April 29, 2008 on the occasion of the visit of the Iranian President Mahmoud Ahmadinejad to Sri Lanka, at Sapugaskanda, former president Mahinda Rajapaksa said, “Two gifts by Iran to Sri Lanka to build the Uma Oya reservoir project and a modern oil refinery were the noblest gifts we have received recently. Sri Lankans are visibly moved by this great gesture, said President Mahinda Rajapaksa. A reservoir is the noblest gift one could give the Sri Lankan people.” However, President Ahmadinejad was not able to lay the foundation stone at Uma Oya due to bad weather conditions. By December 2014, the Iranian gift had become a death trap for the villagers in Bandarawela. Other than the irrigation water to Wellawaya and Hambantota it was promised to add 120 MW to the generation system with 230 GWh of annual energy generation. It was expected to connect the power plant to the national grid in 2015. The estimated cost of the project was US$529 million and 85% of the total project cost was provided by the Government of Iran through Export and Development Bank as a loan. By now more than 7000 million rupees has been paid as compensation for the affected communities which is not even 20% of the total damage done by the Uma Oya Project. Despite the failure of the project, Sri Lankan citizens will pay this money back to Iran in the next couple of decades. The project had neither a proper feasibility study nor an acceptable EIA with possible alternatives. Hambantota Harbour was built by digging Karagan Levaya, which was one of the best lagoons for migratory birds that arrived in Sri Lanka. Feasibility study for the harbour was rejected by the ministerial task force since the study was not bankable and no proper feasibility study done in 2002. Yet the project was pushed by the previous regime and it became another white elephant. Total estimated construction cost of Phase 1 of the project was US$361 million out of which, 85% was funded by the EXIM Bank of the People’s Republic of China. Then Sri Lanka Ports Authority Chairman boasted that the Singaporean Ambassador in Sri Lanka when touring the site said: “We’d better find ourselves another job”. Sri Lanka being at the very epicenter of trade routes will be able to accommodate even the largest of ships and cater to their needs. As expected, no shipping line was interested in using the harbour. In July 2017, the Sri Lanka Ports Authority (SLPA) leased out the Hambantota Port to China Merchant Port for a 99-year period at a price of US$1.1 billion. The SLPA has built an artificial island on the 110 hectares near Hambantota Port at a cost of over $500 million during the previous Rajapaksa regime. This man-made island which has been built as an entertainment facility was also given to a Chinese company. These were just two occasions that Department of National planning and the Ministry of Finance did not play its role when screening the suitable projects for the country. As a result, the Sri Lankan public pay heavy cost to pay back unnecessary and illegitimate debts. Sri Lanka’s total nett external debt exceeded $50 billion in 2017. Sri Lanka’s large external debt repayments total US$4 billion per year between 2019 and 2022.Under the previous regime from 2004-2015 the government had borrowed 5.17 trillion rupees as loans including 2.16 trillion rupees ($14.06 billion) of foreign loans. According to the Central bank’s latest records show Sri Lanka’s total outstanding debt was 10.3 trillion rupees as at the end of September 2017. Considering the failed projects such as Mattala Airport, Hambantota Harbour, Uma Oya diversion and some other partly successful projects such as Moragahakanda, Yan Oya, etc., half of Sri Lanka’s debt could be considered as illegitimate debt. Illegitimate debt includes loans that were knowingly given to oppressive regimes and dictators; caused harm to people, environment and communities; violated human rights; violated basic notions and rules of fairness, and basic assumptions of public contracts; violated democratic principles and exploited the vulnerability, impoverishment and misfortune of others. The accumulation of both legitimate and illegitimate debt in Sri Lanka in the recent times have caused enormous pressure on the country and the citizens who often see it as a tax increase and increase in the price of goods and services. In recent months Sri Lanka has been cited by several politicians and the media in other countries as the latest victim of the Chinese debt trap diplomacy. There are many African and Asian countries which struggle to pay the debt accumulated with Chinese investments overseas. China Belt Road Initiative is one of the mechanisms to draw countries to this debt trap. However, it is the ruling regimes of each country that have the right to engage or avoid. It is unfortunate the development decisions in Sri Lanka has no much public acceptance or has public opinion been sought. There is no such educated voice in the Parliament or a dialogue happening in the country to select the development we need on a national basis. Unfortunately, development decision-making is in the hands of a handful of corrupted politicians. The past experience shows bureaucrats have no say on these decisions or either they are corrupt too. It is paramount to correct the system and clean the politics before Sri Lanka gets drowned in this debt crisis.